Turkey's Operation Olive Branch will continue until all PKK and affiliated terror groups are cleared from Turkey's southern borders, all the way to Iraq, President Erdoğan said Friday. "We will continue Operation Olive Branch until all targets are achieved. After that, Manbij will also be cleared of terrorists, as it was promised to us. No one should be bothered by that because the actual owners of Manbij are not the terrorists there, but rather the owners are our Arab brothers there. And after that, we will continue our struggle until all terrorists are eliminated," the president said in Ankara. Erdoğan's comments came after some U.S. officials called on Turkey to put a time and space limit to its operation against the terrorist PKK's Syrian affiliate, the Democratic Union Party (PYD) and its armed People's Protection Units (YPG) in Afrin. The president pointed to the U.S. operations in Afghanistan and Iraq as per the fight against Al-Qaida terrorism, saying the U.S. was in Afghanistan and Iraq for nearly two decades. The YPG's ultimate aim is to establish an autonomous region in northern Syria by connecting the northwestern Afrin canton to the Kobani and Jazeera cantons in the northeast. As such, Turkey's operation will put a stop to establishing the autonomous region, which Ankara terms a "terror corridor." The U.S. partnered with the YPG in Syria against Daesh, ignoring the group's organic links with the PKK, a group recognized as a terrorist organization by the U.S., Turkey, the EU and the U.K. Ankara has argued that the fight against Daesh should be conducted by partnering with legitimate armies or other moderate local forces, saying the YPG is no different than the PKK. "A terrorist group cannot be beat by another terror group," the Turkish government has long argued. Previously, the U.S. administration under former President Barack Obama had promised Turkey that the YPG terrorists would move east of the Euphrates. However, despite warnings from Ankara, the promises were not kept, and the YPG did not move east of the Euphrates. In addition, the U.S. continued to arm the group, an initiative that also began during the Obama administration and continues under U.S. President Donald Trump. The U.S. has reportedly sent nearly 5,000 truckloads and 2,000 aircraft-loads of weaponry and military support to the U.S. so far. As a result of the broken promises by the U.S., Turkey also shifted its position and vowed to clear all terrorists from northern Syria, including Manbij and the eastern parts of the Euphrates. Operation Olive Branch was launched on Jan. 20 to clear YPG terrorists that have been harassing Turkey's borders for a long time. Ankara argues that Operation Olive Branch is conducted in line with international law and U.N. Security Council decisions, especially no. 1624 (2005), 2170 (2014) and 2178 (2014), and as per the right to self-defense in Article 51 of the U.N. Charter. The president also criticized the U.S., saying terrorist organizations in the region were moving around with American flags. "Mr. president tells us, 'Do not criticize us that much.' 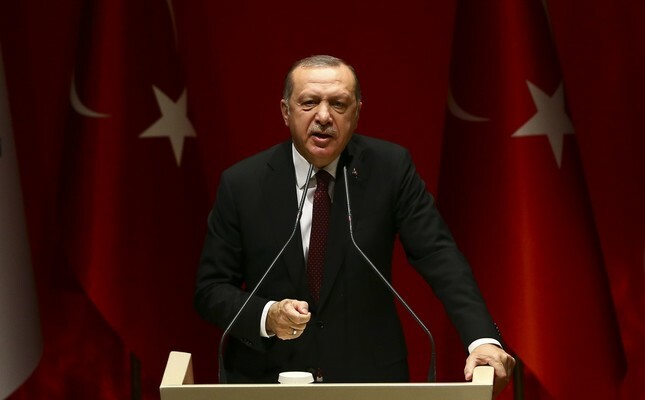 All right, but, since we are strategic partners, how can a strategic partner do such a thing to its strategic partner," Erdoğan asked, referring to President Trump. Meanwhile, President Erdoğan spoke with British Prime Minister Theresa May. The two leaders discussed the recent developments in Syria and Turkey's Operation Olive Branch. Erdoğan conveyed to May that Turkey is taking every necessary measure to minimize civilian casualties and that all terrorists are being targeted by Turkey. May reportedly expressed appreciation to Turkey's ongoing efforts to establish stability in Syria, as well as Ankara's counterterrorism efforts against Daesh. During his speech in Ankara, Erdoğan also rejected claims that Turkey is invading Syrian territories with the newly launched offensive against the YPG, saying: "We are not occupying Afrin. On the contrary, we are trying to make it a livable place for the real owners, while clearing out terrorists from there." He said the operation was a "clear warning" to those who did not want to understand Turkey's determination in the fight against terrorism. He reiterated that the ongoing operation was directed "purely and simply" against terrorists. "Here, I once again declare to the world. Turkey's operation in Afrin purely and simply aims at the terrorist organizations and terrorists," Erdoğan said. At least 343 PKK/KCK/PYD-YPG and Daesh terrorists have been killed since the start of Operation Olive Branch, while 25 new targets were hit on the sixth day of the offensive, the Turkish Armed Forces (TSK) said in a statement Friday. The TSK carried out airstrikes on shelters, positions, arms, and equipment of the terrorists during the night, according to a General Staff statement. All 13 aircraft returned to their bases after hitting 23 terrorist targets, the statement added. The KCK (Kurdistan Communities Union) is the umbrella entity that includes the PKK in Turkey, the PYD and its armed YPG wing in Syria, the Kurdistan Democratic Solution Party (PÇDK) in Iraq, and the Kurdistan Free Life Party (PJAK) in Iran. According to the military, the operation aims to establish security and stability along Turkish borders and the region as well as protect Syrians from terrorist oppression and cruelty. The military has also said that only terrorist targets are being destroyed and the "utmost importance" is being put on not harming any civilians.